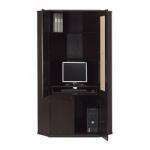 Provides space for all your computer equipment and office material - and hides it when you're not working. Adjustable shelves; adjust according to need. Pull-out shelf for easy access to keyboard and mouse. Cord outlet at the back; collects cords and cables in one place. Holds up to a 19" monitor. We recommend you to fix the furniture to the wall with the enclosed safety bracket to prevent it from tipping over if a child climbs or hangs on it. Great price for a pine hidden workspace doodah. I can't guess why the sides are shaped like that though... surely it just takes up room unnecessarily?